In Game 4 of the series between the San Jose Sharks and Vegas Golden Knights, the Sharks posted a 4-0 win. For the third consecutive game, the Sharks outskated the Golden Knights. For the third straight game, San Jose found success by going behind the net. But there was something new this game. 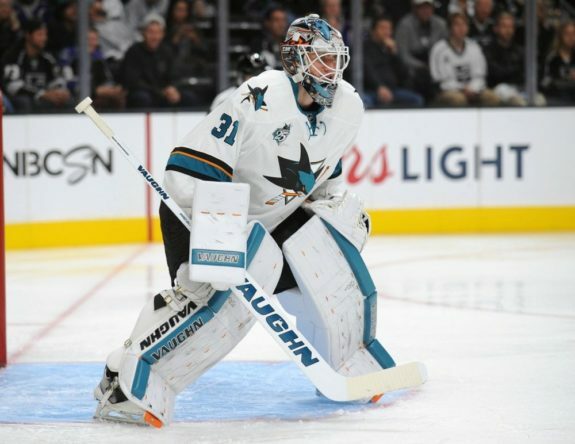 Sharks goalie Martin Jones outplayed his counterpart, Marc-Andre Fleury, for the first time in the series. While Jones was special and occasionally spectacular, the same couldn’t be said for Fleury. Fleury was average for the first time in the postseason, even letting in his first soft goal. San Jose moved out to a 1-0 lead when their fourth line buried Vegas deep in their own zone. 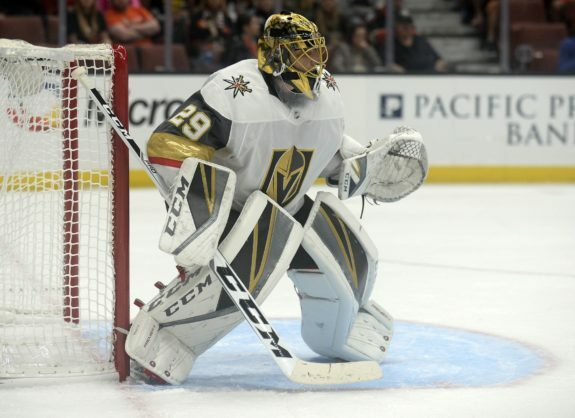 Play behind the net scrambled the Vegas defense and Marcus Sorensen emerged from the chaotic scene, circled the net and put the puck past Fleury. The Sharks fourth line was effective all evening. Late in the opening period, Joonas Donskoi came into the offensive zone with two Vegas defenders in his way. He fired the puck from a bit inside the blue line, shooting it between the legs of Brayden McNabb. It shockingly beat Fleury. The soft goal gave San Jose a 2-0 lead, their first multi-goal lead of the series. In the second period, the Sharks added to their lead. Once again, play behind the net led to a Sharks score. In this case, Mikkel Boedker took the puck behind the net and tried a wraparound. Fleury blocked the attempt, but the puck bounced to the far side of the crease where Tomas Hertl knocked it home. With a 3-0 lead, the Sharks were in control of a game on both the ice and on the scoreboard for the first time in the series. In the final period, San Jose produced the game’s final tally. Once again, play behind the net was key. The Sharks drew a tripping penalty on McNabb behind the net and went on their on their third power play of the game. On the power play, Joe Pavelski buried a rebound of his own shot to make it 4-0. The game got progressively chippier, but the Golden Knights made no dent on the scoreboard. The Sharks had issues with their poise in their series opening 7-0 loss, Vegas had some poise issues of their own in Game 4. As I’ve discussed in previous articles, the Sharks get their scoring offense against Vegas from play behind the net. Every time they can, the Sharks need to go behind the net with puck. I call it the “Prime Directive.” They didn’t do it nearly as often as they could during the game, even as they won. The Donskoi goal stands as the Sharks lone even strength goal in the series which didn’t result from play behind the net (another was technically even strength, but came concurrent with the end of a power play). Three power play goals came off of penalties drawn with play behind the net. In total, eight of the Sharks 11 goals in the series are directly tied to play behind the net. San Jose has found the way to beat Fleury. They can beat him on the power play and they can beat him from play behind the net. And since play behind the net has led to about half of the Sharks power plays this series, its valuable in multiple ways. With the Sharks consistently getting the better of even strength play over the last three games and finally finding ways to beat Fleury, the series heads to Vegas. Still, nothing is going to come easy for either team. Good news for the Sharks, Jones has had lengthy stretches this season where he’s been consistently outstanding. It wasn’t a surprise he was a bit off his game after the long layoff to start the series. It is also no surprise he is dialed back in after a few games. If he stays this way, the hurdle for Vegas increases. If Fleury is no longer quite as brilliant as he’s been, the Vegas hurdle goes even higher. Some have suggested Vegas may have seeds of doubt, but I’m not buying it. Vegas is a confident team; they’ve bought into a system which has worked all season. A couple of losses won’t shake them. The Sharks have matched the Vegas intensity and their physical game has proven hard for the Golden Knights to handle. Vegas will need to find a way to respond to a Sharks team which is outplaying them and at least for one night, out-goaltending them. Fortunately for Vegas, they’ll get a chance to rebound on home ice, where they’ve been outstanding all season. • Much was made about Paul Martin’s problematic play in Game 3, including on the game-winning goal. Even former Sharks broadcaster Drew Remenda weighed in (beginning at the eight minute mark). Joakim Ryan made his NHL playoff debut, replacing Martin in the lineup. Though Ryan only played 12 minutes, he was solid on every shift. Perhaps he’ll see his ice time increase as he returns to game shape, following a six week absence from the lineup. • Donskoi returned to the Sharks lineup after a one game, injury-related absence. Barclay Goodrow drew out of the line-up. 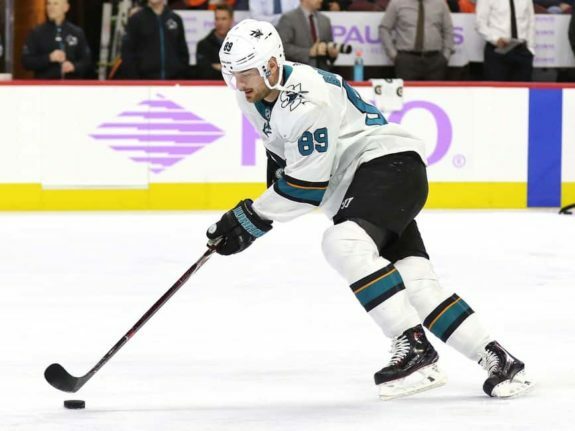 • The Sharks defensive headliners are usually Marc-Edouard Vlasic and Bent Burns. Today, Ryan was a big story. But in the game, it was third pair defenseman Brenden Dillon who was plus-3 while garnering two assists. • Maintaining 60 minutes of intensity against Vegas isn’t easy, so it helps to roll four lines. The Sharks fourth line players; Sorensen, Eric Fehr and Melker Karlsson averaged 12 minutes of ice time in the game.